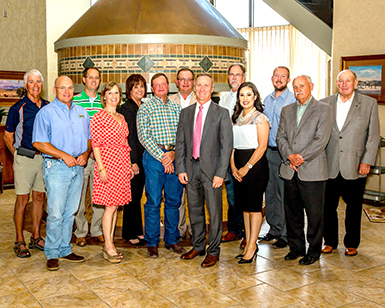 Artesia Aquatic Center Foundation representatives meet with First American Bank staff and board of directors to accept a donation for the Artesia Aquatic Center project. “First American Bank is proud to participate in making Artesia a better place by supporting the Artesia Aquatic Center with a $100,000 donation,” Bank CEO and Chairman Greg Marrs said. “This center will provide recreational activities which in turn will make a positive impact on children, teenagers and adults in Artesia, as well as surrounding communities. First American Bank supports Local First Initiatives and believes in investing dollars and time into the communities we serve.” Artesia Aquatic Center construction is scheduled to commence this summer, with completion planned for May 2019. Pictured are, back row from left, Johnny Knorr, Ben Harvey, Vicky Townley, John Bain, Rusty Smith, Joel Miller, Bill Mershon, front row from left, Daniel Johncox, Hayley Klein, Mike Casabonne, Greg Marrs, Sandra Borges and Bryan Bartlett.